I am really, really bad at painting reflections in glass and metal. 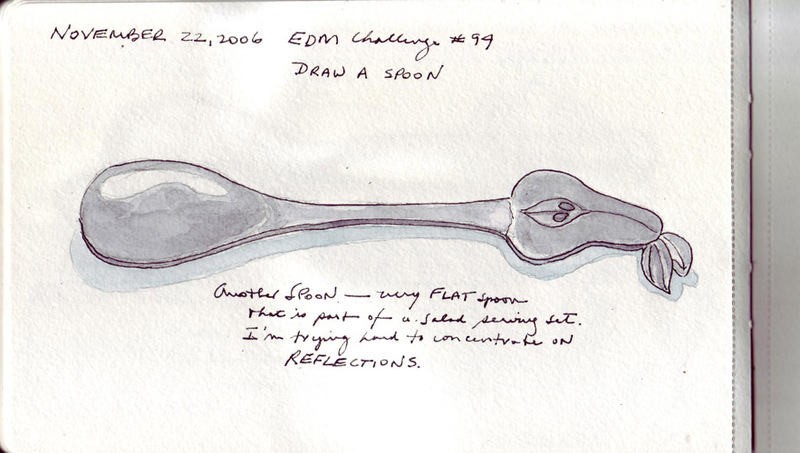 So I actually drew spoons for 2 days to try to improve my skills. 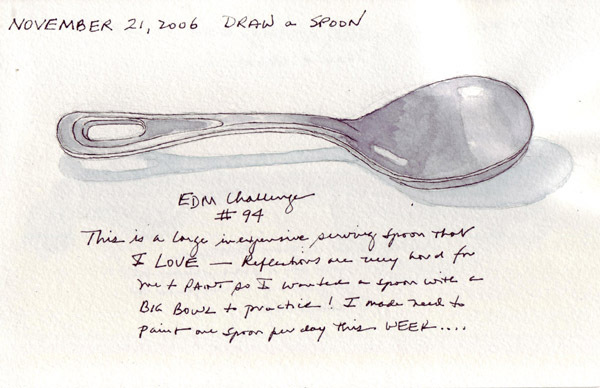 In reality, I would need to paint reflections every day for an entire year to understand what I am doing. As I type this I realize that I never even cropped the second sketch so it is very obvious that I am using the Moleskine watercolor journal now for my daily practice. I am able to use both sides of each page using watercolor, so I am enjoying the process and results as I flip through my visual record of the recent weeks. EDM Challenge #90: Draw Something with WingsI was in London during the "Wings Challenge" and saw mostly pigeons! 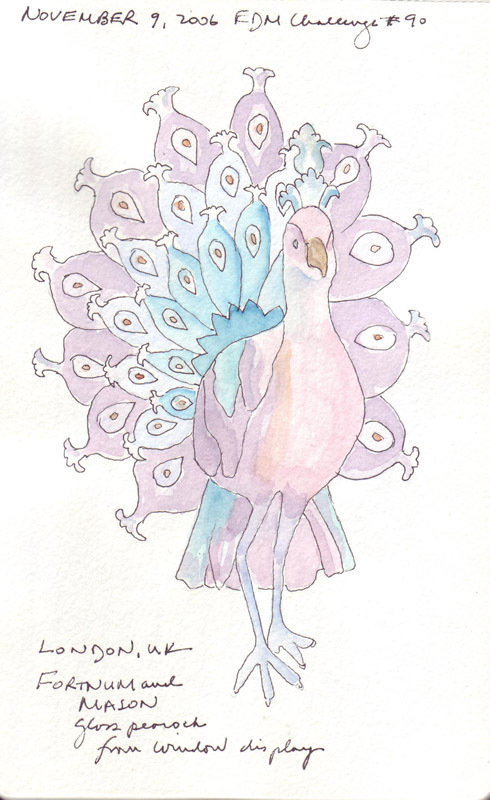 However, on a long walk past Fortnum and Mason, I saw this wonderful large glass peacock that was a major feature in one of their window displays. 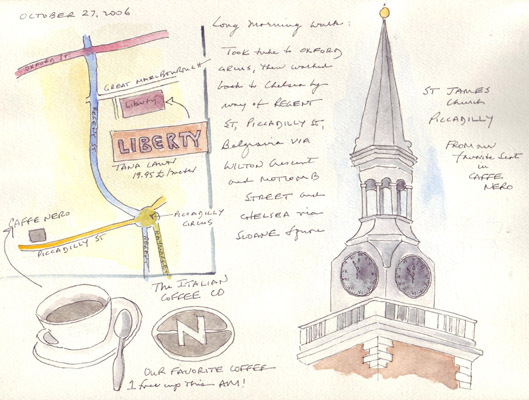 My husband had just patiently had coffee while I sketched St. James Church and I decided not to push my luck and his patience. So I took several photos and waited to sketch and paint my bird until I returned home from my travels. 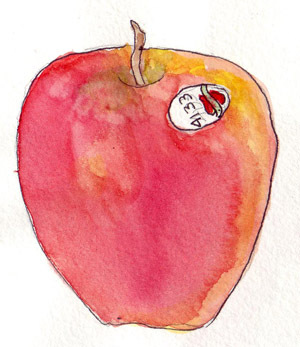 EDM Challenge #91 - Draw an Apple: I don't eat apples and I therefore had to find one to sketch and paint. I wasn't working wet enough to get good blending of all of the colors, but I try to share all sketches, whether I like them or not. 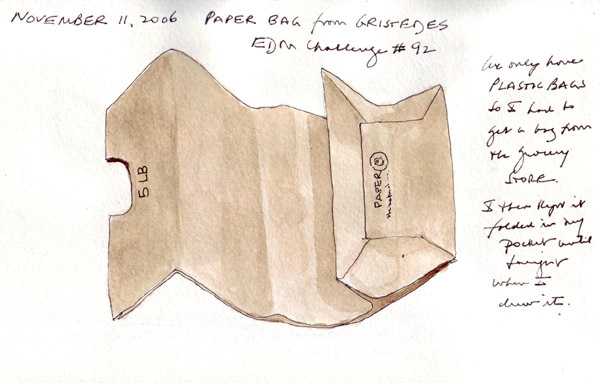 EDM Challenge #92 - Draw a Paper Bag: We didn't have one brown paper bag in our apt, so I begged a small one from my neighborhood grocery store, folded it, and carried it in my pocket the rest of the day. 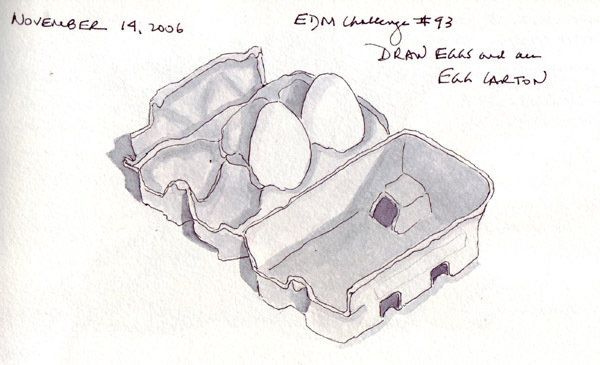 EDM Challenge #93- Draw Eggs and an Egg Carton: My husband immediately told me how wonky the egg on the left is - which of course I knew as soon as I drew it. But I bore easily and couldn't bring myself to start over or repeat the sketch the next day. We're trying to clean out the refrigerator before we gather our groceries for a big Thanksgiving dinner, so we won't have a fresh dozen eggs until next week. So here is my egg carton and last 2 eggs. Immediately after arriving home from London, I unpacked, repacked, and flew off to Houston Texas for the International Quilt Festival. I started quilting in 1980 and attended my first Houston Quilt Festival in 1983. It was relatively small and held at the old, wonderful Shamrock Hilton Hotel. Since then it has changed venues several times and continued to expand. This was the 23rd year that I attended and it now fills the entire Houston Convention Center - all 5 parts. 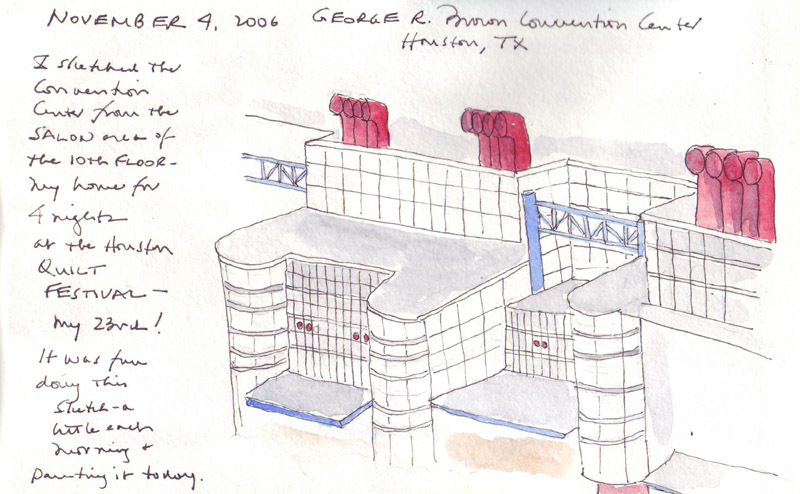 I sketched this view of just one of the 5 parts from my 10th floor room at the Hilton Americas. The building always reminds me of the Pompidou Museum in Paris. 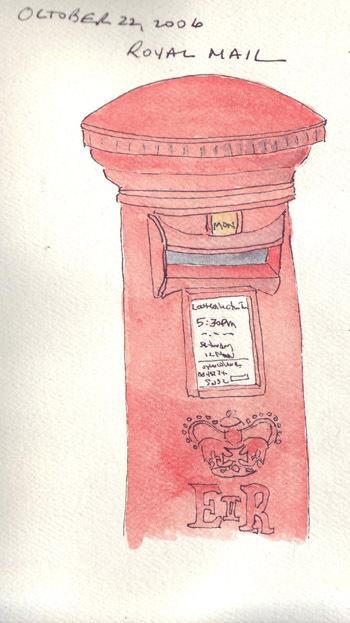 I love London public mailboxes and the old style public phone booths. This mailbox was painted very quickly in the rain during a walk to the grocery store on King's Road Chelsea. Click on each image for a larger size. This is a statue on Pont Street in Belgravia - it is tucked into a small area with pretty trees and benches. I was fascinated to see that it is the logo for the Jeeves Complex - a group of stores in the area. We walked from Oxford Circus all the way back to Chelsea - browsing all the way. My husband humored me by touring the fabric section at Liberty to price fabric for my latest quilt. When we stopped at Caffe Nero, our favorite coffee shop in London, I sketched the tower of the St. James Church across the street. We took care of our grandchildren our last weekend in London while my daughter and her husband explored the town of Bath. By the time we finished a full day with them on Saturday, the only thing I could think of for my daily sketch was the bath tub toys that they just played with. 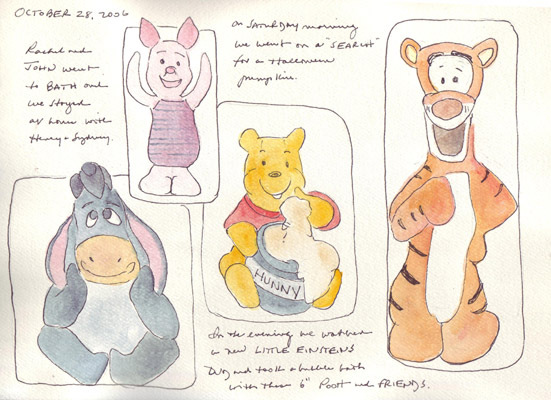 My 22 month old grand daughter loves Pooh and his friends. My daughter and her family are living in Chelsea, right off King's Road, so I have many opportunities to walk in the neighborhood with strollers and my grandchildren. 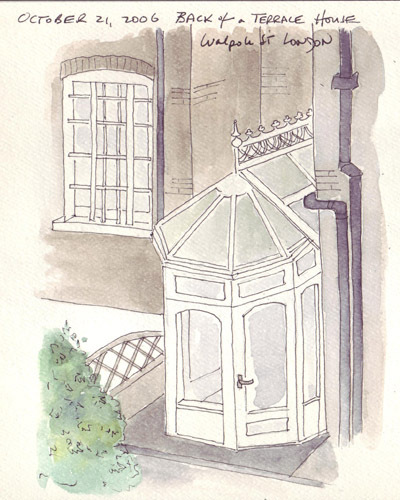 The sketch on the left is the back of one of the terrace houses on Walpole Street. As you look down the row of houses, it is interesting to see how each owner has added space in a variety of ways around their back entry. This sunroom addition has a wonderful round table that is bathed in sunlight and surrounded by flowers. 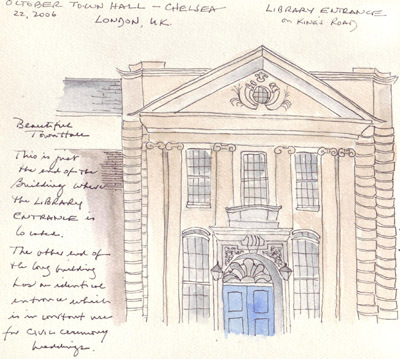 The sketch on the right is the Library entrance to the Chelsea Town Hall. The other end of the long building is identical and there are civil ceremony weddings occurring there almost everytime that I walk past. 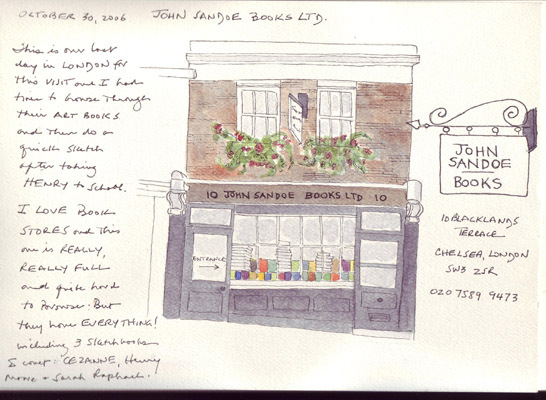 Left: John Sandoe Books - a wonderful, packed book store that is purported to have everything. 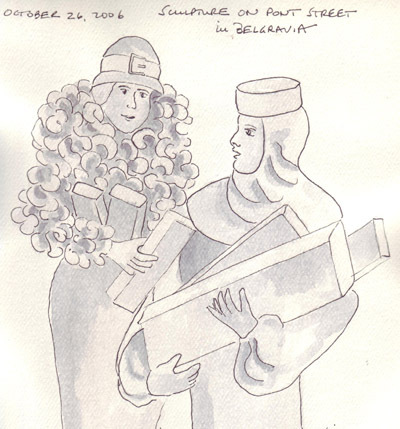 During my last two visits, I have lovingly looked at Cezanne's Basel Travel Sketchbook and Henry Moore's Sheep sketchbook in the store. It is hard to buy anything in London, however, that is available in the US because the exchange rate is currently so bad. Right: A regular dinner spot for our family - The Big Easy on King's Road Chelsea. They have an American menu which is perfect for our toddler grandchildren. 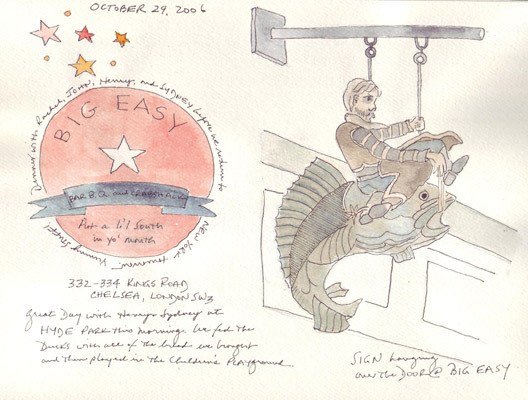 I loved the fisherman/fish sign the first time I saw it in July, and finally had time to arrive at the restaurant early and sketch it.